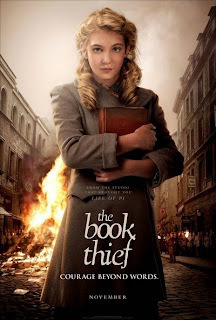 The Book Thief was originally released in 2007 and it was then that I made my first attempt to read it. For whatever reason at the time, the narrator - Death - disturbed me. I believe I got about two chapters into the book before I found myself too creeped out to continue. I closed the covers wondering how it was that everyone else was raving about it. Yet, they went on raving and raving and I began to suspect an error in reading judgement on my part. Content to wait to read it "someday", I sort of forgot about it. Then they announced that a movie was being released based on the book and that started everyone talking again. I figured I really had better read it before someone spoiled the plot for me by accident. Enter: a trip overseas to pick up Bookworm4. My very nice husband bought and downloaded the movie on our laptop so that could watch it on the long plane ride over. Problem: I still hadn't read the book! The moment for absolutely needing to read it had arrived. I hastily purchased a copy of the book on Amazon and devoured it, finishing it on our first plane ride. I absolutely loved it. I have absolutely no idea what I found so off putting on the first go around. Now it is only my job to add to the raves about this being a "must read" book! In case you are unfamiliar with the storyline, I'll give you a brief description and avoid all spoilers. This book tells us about fictional Liesel Meminger who lived in Germany during World War II. We begin following her journey as a young girl who is being given up for foster care by a mother who can no longer care for her. Liesel is placed with Hans and Rosa Hubermann, an older couple who live in Munich. Liesel must learn to adapt not only to their household, but to the effects that the war has on her new friends and neighborhood. The narrator of the story is Death which could make for that creepy overtone I mentioned earlier, however, I think it is nicely played out. Who else could speak of war so well as death? 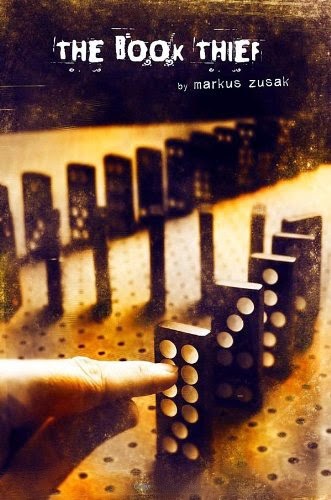 This story by Markus Zusak discusses several different topics: the treatment and hiding of Jews, the Nazi party, the loyalty the party demanded from German citizens, as well as the lack of approved reading materials under Hitler's regime. It paints a picture of Jewish sympathizers in Nazi Germany which is an angle not many authors pay attention to, choosing instead of paint all Germans out as being cold and callous instead of frequently sympathetic and just plain scared to disagree! There really was not a page of The Book Thief that I did not like. Every bit of it was entertaining, engaging, captivating and a lot of other positive adjectives I just can't think of at the moment. I'm so glad that I purchased an actual hard copy of it, for I plan to re-read it again someday. One critic praised this book as being "destined to be a classic." I don't know that I can agree with that entirely but I would agree that this is a modern publication that is worth some attention and I wouldn't mind if it stood out in the crowd of books published since the year 2000 for future generations to read and think about. The paperback version of this book is an easy 550 pages. I say easy because the story is so very interesting that you won't grow bored with the story telling for a second. Zusak unfolds his story in a beautiful way, causing the reader to keep turning pages. This book is perfect for high school students but I wouldn't blink an eye at the thought of handing it over to a middle school reader. The only thing to note is that there is some foul language scattered about. These words were not so frequent as to distract me from my enjoyment of the story, nor so infrequent as to cause me to ignore them completely. They are there and if foul language bothers you then you should be aware of that. Of course, once I had finished the book we were released to watch the movie. (Ha!) I thought the movie followed the storyline fairly well, though of course the movie is never quite so good as the book itself. The story is less complex on screen and therefore it felt a bit unsatisfying on the heels of this fascinating, heart-wrenching read. I was warned that I would likely cry at the end of the movie. I wasn't as moved as all that because I found the book so much more powerful and I had just finished it. Definitely read the book before you watch the movie but if you've already messed up and watched it, please know that your sins can be pardoned. Just go read the book. You will appreciate the story so much more if you do! Thanks, Zusak, for such a fine story! Pleased to throw my recommendation in with all of the others! I loved it, too, when I read it way back when. I still haven't seen the movie and in fact had forgotten about it. Thanks for the reminder! I haven't read it yet but wanted to! I'm glad you liked it. I didn't know there was a movie. Destry just picked it up off the shelf this morning thinking to read it this summer. Now I'm wanting to read it again. I promptly went out and bought his new book, I Am the Messenger which I am looking forward to diving into! I too started reading this book a few years ago and was disturbed at the narrator being death. I might have to revisit the book at some point but haven't been tempted to watch the movie. When I first heard of this book and heard it was narrated by death, I thought that was a little weird and off-putting. But then, like you, I've heard everyone raving about it, and the story does sound intriguing. I'm holding off until I decide about the language - usually I avoid books with bad language but occasionally a story does transcend that kind of thing. Loved the book and enjoyed the movie, too. I didn't know he had a new book and will be curious to hear your take--if you get through it. Ha! So glad you loved it the second time around...especially since it's one of my all-time favorite books. I thought the movie was well done, too. When you mentioned in your comment on my review about reading it, I had to come back and see what your thoughts were. I knew a number of blog friends had mentioned this book but I couldn't remember which ones. I agree with your thoughts!